It’s January, which means that troves of people made the exact same New Year’s resolution; “I want to lose __ pounds this year!” No offense to those who make resolutions, but let’s be real for a second. How many people who make this resolution actually stick it out? Come January, everything and everyone is all about the diets and the “cleanses” and “detoxes.” After touting the “enjoy and indulge” messages of months prior, everyone seems to be on the same boat about losing the holiday weight gain. After a couple weeks (or even days), most people want to give up and give in. I personally know how hard it can be to stay on track, especially after the holidays, but seeing and hearing all this “diet” talk does the opposite of motivating. See, diets, “cleanses” and “detoxes” are all about restrictions. It’s all “Don’t eat this for x amount of time, don’t eat this kind of food after a certain time, don’t eat anything but this drink for the next week.” It’s too stressful to try and stick to all these guidelines, which are really just set ups for failures. A healthy lifestyle is not about restricting. A common misconception people have about living healthy is that no one ever eats sweets; that it’s all fruits and veggies all day. Granted, it’s mostly that but a small part of it is about enjoying yourself and living your life stress free (at least about food). That’s the healthy part! Ingredients! Vanilla extract not pictured. Mixed and ready for the fridge! Refrigerated mix, ready to be scooped. 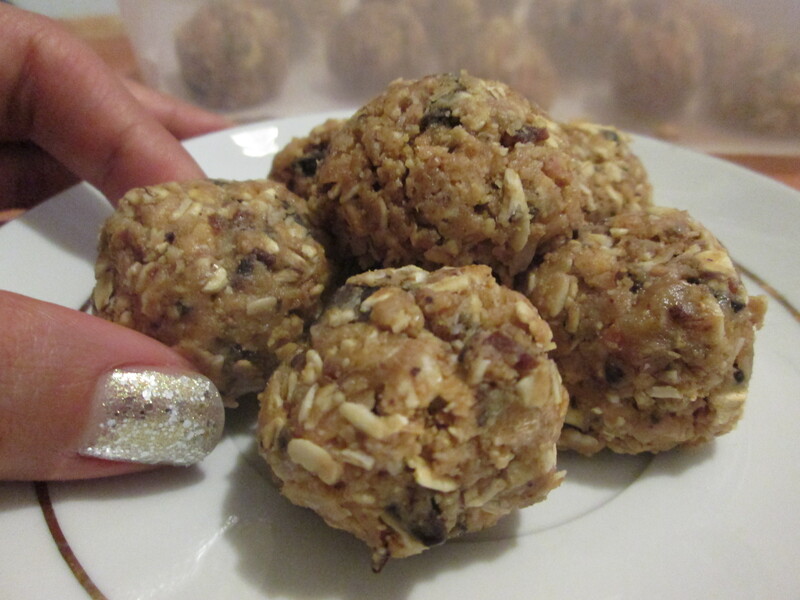 Anyway, these no bake energy bites are an awesome and relatively healthy snack that are as easy to make as they are delicious. All the ingredients in these babies are actually good for you! Oats are a great complex carb, which means they’ll keep you full a bit longer. The peanut butter and the coconut are both full of good fats, even though the coconut is slightly sweetened. Honey’s a natural sweetener that is okay in moderation. And chocolate is surprisingly good for you if you use the right kind! Dark chocolate is the “healthiest,” touting plenty of antioxidants; depending on how dark the chocolate is. 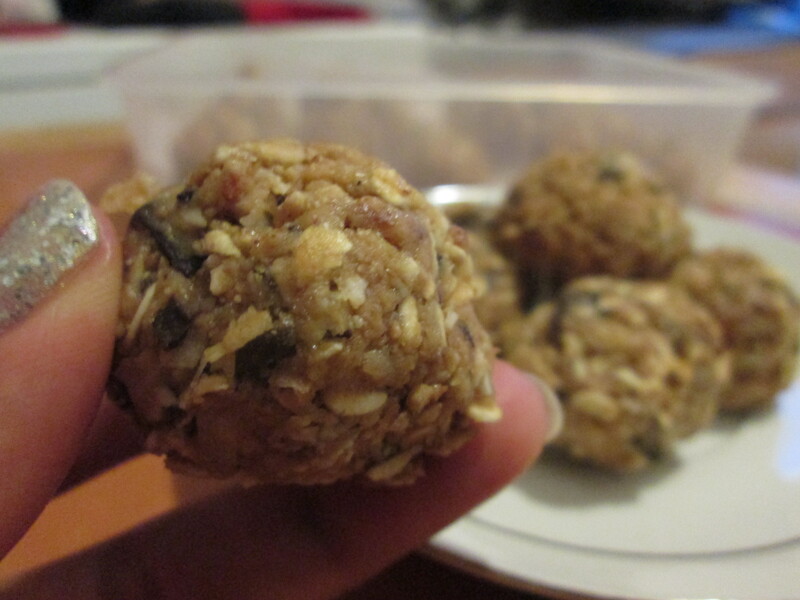 One of the standout ingredients on the list is the ground flaxseed. Not only is it a great source of dietary fiber, but it is laden with micronutrients (like Vitamin B), omega-3 fatty acids, and even more antioxidants. 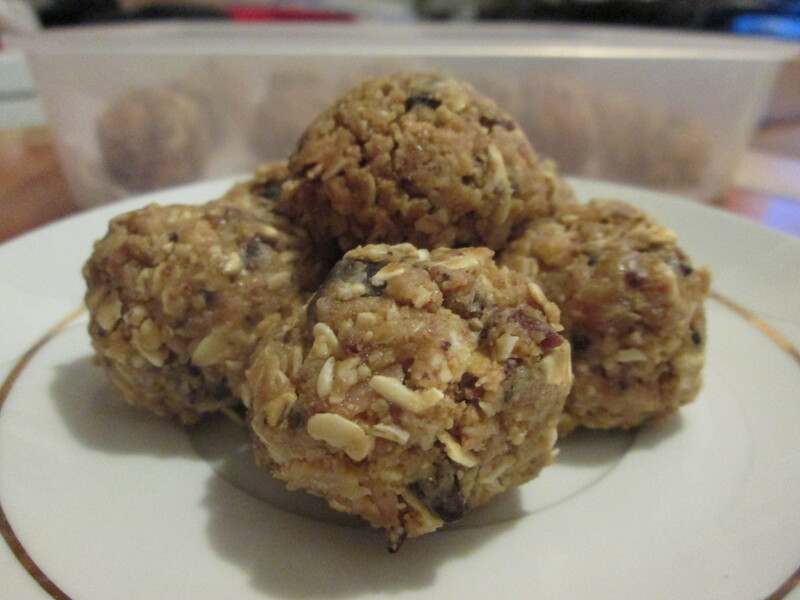 It’s a great addition to most baked goods and is awesome (and tasteless) in these energy bites. When you finally get sick of hearing about all that diet talk and are ready to jump ship, remember that it’s a race rather than a sprint. A healthier lifestyle includes all of the things life throws at you, including these little bites of energy that’ll help you tackle the rest of the day! Stir all of the ingredients in a bowl, making sure everything is thoroughly combined. Cover and refrigerate for 30 minutes. I chopped up a small 72% dark chocolate bar from Trader Joe’s, in lieu of chocolate chips. Use whatever you have on hand! I used a disher to scoop these out. Each ball came out about 1 1/2″ in diameter. This recipe is infinitely adaptable. You can use a variety of mix ins and nut butters; anything to suit your tastes!